CAPITOL HILL — The 115th Congress will consider a number of sweeping changes to American life, from health care to tax reform to government regulations, but one area that won't see significant change will be within the halls of the House of Representatives. Following a groundbreaking election dominated by social media, the new Congress has instituted new rules fining lawmakers for recording and broadcasting video and audio from the House floor. The changes are a direct Republican response to Democrats' gun control protest sit-in last summer. For Rep. Scott Peters — the lawmaker who first thought of using social media to get the protesters' message out to the public — the fines are a missed opportunity for Congress to keep up with the times. "Why would we want people to know what's going on in Congress?" he told VOA. "It's a shame." The House went into recess shortly after Democrats began the sit-in, allowing Republican leadership to turn off cameras broadcasting floor action. Deprived of a means of getting their message out, Peters and other Democrats turned to popular streaming apps Facebook Live and Periscope. The nearly 26-hour sit-in marked another key moment in the changing relationship between politicians and social media. 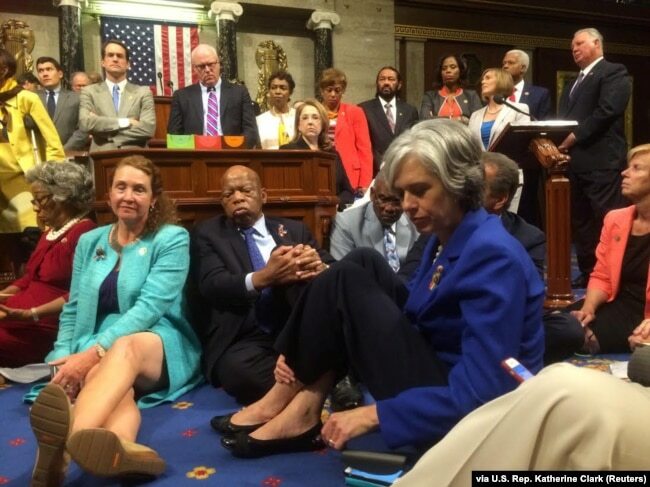 FILE - A photo shot and tweeted from the floor of the U.S. House of Representatives shows Democratic members of the House staging a sit-in on the House floor "to demand action on common sense gun legislation" on Capitol Hill, in Washington, June 22, 2016. "People were able to see the perspective that we have on the House floor everywhere in the world," Peters said. "It was kind of a remarkable moment in the history of American government." Members of Congress have always been banned from using electronic devices on the House floor. But the Democrats' work-around using social media apps prompted House Speaker Paul Ryan to institute the penalties. "These changes will help ensure that order and decorum are preserved in the House of Representatives so lawmakers can do the people's work," Ashlee Strong, a spokeswoman for Ryan, said in a statement last month. But Rep. John Lewis — leader of last summer's gun control sit-in and a veteran of the civil rights movement — took to the House floor to denounce the fines, saying the changes violated members of Congress’ freedom of speech. "No Congress, no body, no committee has the power to tell us we cannot stand up, speak up and speak truth to power. We have a right to dissent. We have a right to protest what is right," Lewis said in an unsuccessful attempt to strike the changes from the rules package for the 115th Congress. While Democrats and Republicans have framed the debate as a clash between freedom of speech and maintaining the dignity and order of the House of Representatives, the bigger question may be a matter of finding a way for the nation's lawmakers to keep up with the times. 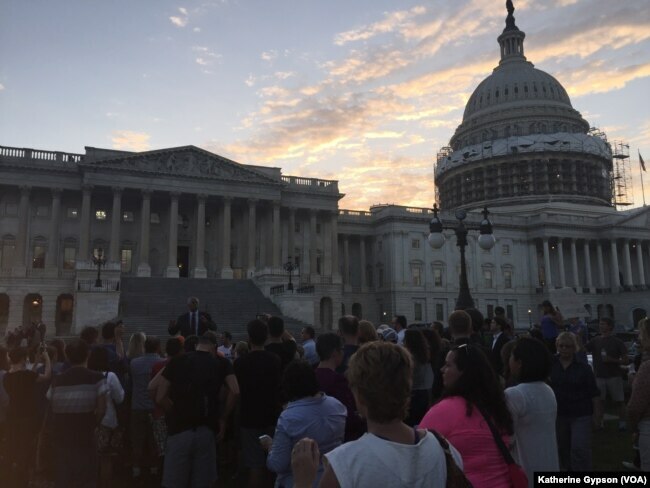 FILE - About 150-200 people gathered outside the Capitol in support of House Democrats who were holding a sit-in to force action on gun control legislation, June 22, 2016. "As the world becomes more dynamic, our Congress and our leaders should be thinking about how to simplify the way that our government communicates with our population," social media analyst John Crandall told VOA. "This kind of connection is so visceral and so immediate," Peters told VOA, "There are these technologies that can connect the American people to their government in ways we've never seen before." Peters says the immediate problem of party leadership controlling the cameras on the House floor could be solved by the creation of an independent, third-party organization. He says he's sympathetic to concerns about decorum on the House floor, and suggests designated areas or times for members to use social media to help keep voters involved in government. Congress will need to think carefully about the implications of social media and the possible impact its use could have in reaching younger voters who are increasingly demanding more transparency from lawmakers. "It's a losing position however you look at it," Crandall said. "It's like putting your finger in a leaky dike — the water's going to be coming through whether or not you put these restrictions on Congressmen."